Anne can't move a muscle, can't open her eyes, can't scream. She lies immobile in the darkness, unsure if she'd dead, terrified she's buried alive, haunted by her final memory—of being hanged. A maidservant falsely accused of infanticide in 1650 England and sent to the scaffold, Anne Green is trapped with her racing thoughts, her burning need to revisit the events—and the man—that led her to the gallows. This book is the story of Anne Green a young girl who was hung but lived afterwards and became something of a local celeb in the 1650s told by May Hooper if her usual brilliant style. Quite honestly I read this book because it was written by Mary Hooper. For me she is a brilliant example of a writer who writes excellent historical fiction for teenagers. Her writing is flawless but at the same time it isn't boring so that it engages the reader entirely and gives them a real sense of the time period they are fading about. The story is split between the present day third person as Anne's body is prepared for dissection and what happens once the doctors discover she is alive and first person and Anne herself feeling her story of how she came to being hung. The story itself fascinated me and gave me an insight into a part of history I hadn't much thought about in the way in which Anne was treated by the master of the household and how she was regarded by the law. You really get a sense of how helpless and alone she feels and how unfairly women, especially poor women, we're treated by men and society in general. The story involving her death was equally as interesting and another fine example of a story so intriguing from the past that you simply couldn't have made up. A story that teaches you about the way in which women were regarded in the 1650s, the role of religion at that time, the role of the law courts and attitudes of people living at the time which I found compelling and fascinating. 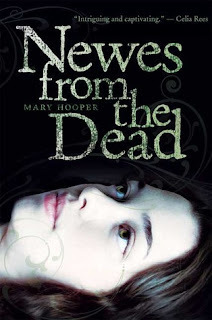 so glad you enojyed this one, I really did too, Love Mary Hoopers writing so much!